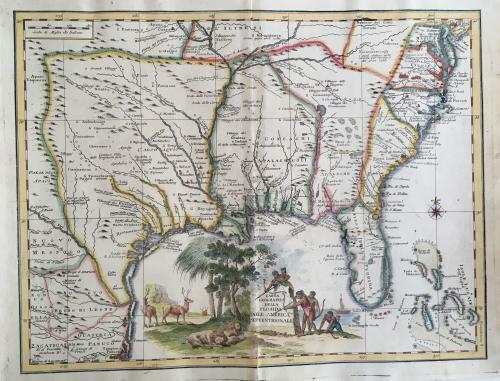 Title: 'Carta geografica della Florida nell'America Settentrionale' from "Atlante Novissimo che contiene tutte le parti del mondo...."
A very interesting map of the South eastern portion of the future United States, based upon De L'Isle's map of 1718. The map extends from the Rio Grande River to the confluence of the Mississippi and Missouri Rivers, and east to include the Chesapeake and Delaware Rivers, and south to Florida and the Bahamas and includes much decoration and a striking cartouche showing an Indian Hunt in the New World. Much detail in Florida, the Gulf Coast, and the Texas Coastline, as well as in the interior of Texas and the South. Two large Mohawk Villages are illustrated and S. Agostino is also shown as a large fortified town as is Charleston and Filadelphia. In very good condition with very minor foxing and a small (3.5 cm) centerfold seperation.